In stock -This product will ship today if ordered within the next 15 hours and 2 minutes. LAMBERTS Eyewise Omega 3 is a high strength one-a-day formula to help support eye health. 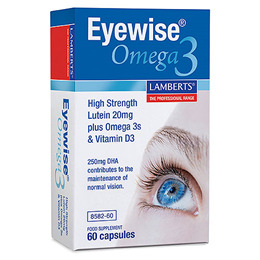 Eyewise contains a synergistic combination of pure ‘free form’ lutein, zeaxanthin and omega-3 fatty acids from pure fish oil, plus natural vitamin D3. Lutein and zeaxanthin are carotenoids that are not made in the body, and so they must be obtained from the diet, most notably from green leafy vegetables. In plants, lutein is produced to help protect the cell contents from damage by sunlight. Our bodies can use lutein in the same way as it is deposited in the macula where it filters out the harmful wavelengths in sunlight that can damage the delicate light receptor cells of the macula. Like all carotenoids, lutein is an antioxidant, and it is therefore believed to play a role in protecting the macula tissue from the damage caused by harmful free radicals. Numerous studies indicate that omega-3 fatty acids may also be especially important in preserving and maintaining healthy eyes, especially as we age. 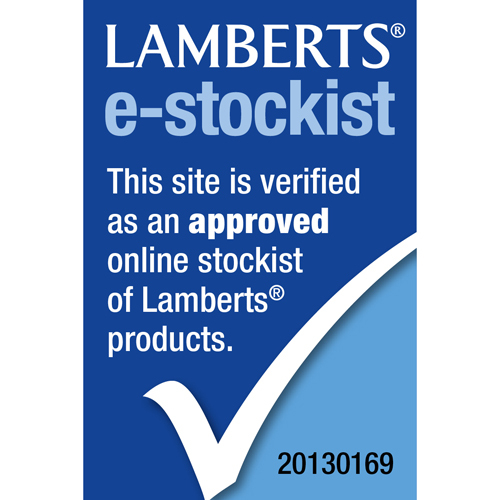 LAMBERTS have included a full 356mg of omega 3s per capsule, including 250mg of DHA which contributes to the maintenance of normal vision. Moreover, the pure fish oil we use is certified from sustainable fisheries. It`s becoming common knowledge that vitamin D is important for far more than bone health. Indeed, there is now emerging evidence from studies that links vitamin D with eye health. Capsule Shell (Gelatin, Glycerin, Colour: Iron Oxide), Fish Body Oil Concentrate (Fish Oil, Antioxidant: Mixed Tocopherols), Lutein Complex* (Lutein & Zeaxanthin), Vitamin D*. *With antioxidant dl alpha Tocopherol. Below are reviews of LAMBERTS Eyewise Omega 3 - 60 Capsules by bodykind customers. If you have tried this product we'd love to hear what you think so please leave a review. LAMBERTS unique high potency, one-a-day formula is a synergistic combination of lutein, zeaxanthin and omega-3 fatty acids from pure fish oil, plus natural vitamin D3, to help maintain eye health.